Six tales of Batman explore his early days in Gotham. Different facets to his persona are explored, illuminating who he is, how he came to be, and how others perceive him. Okay, is it possible to review this direct-to-video feature without mentioning The Animatrix? 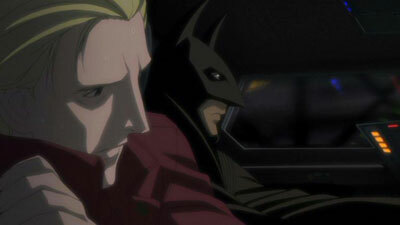 Alrighty, then… Just like The Animatrix back in 2003, Batman: Gotham Knight is being used to help promote the second feature in a series, using animation done entirely in Japan, and a series of stories that explores the mythos set up in the first film. The Animatrix is very well-regarded, so this current movie, the third in the “DC Universe Animated Movie” series, has been well anticipated by fans. Somewhat ironically, then, this movie does not really mirror a DC Universe storyline so much as use Christopher Nolan’s film Batman Begins as a starting point, as it must help set up (to an extent) the happenings of this summer’s The Dark Knight. 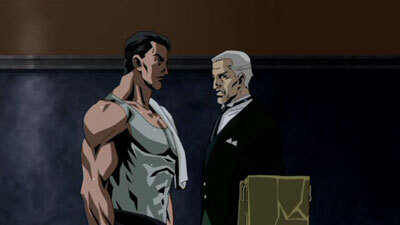 This meant a particular set of rules for the story segments: no appearances by major Batman villains (with an exception or two), and this Batman had to still be portrayed as being relatively young and still establishing his presence in Gotham City. Bruce Timm, mastermind of so many of our favorite DC cartoons, served as an executive producer for this project, but he restrained himself from offering too much input. From the beginning, this movie was envisioned to feature the visions of some of Japan’s leading animators, even if American writers wrote the stories. Some of the visuals therefore stray from any established model, but that’s okay since each of the six segments are meant to mostly stand alone anyways. And, despite a few different looks, I was surprised that so much of the movie had a similar tone to it. This is a “dark and serious” look at Batman’s world, so much so that I would have appreciated a little more levity or perhaps an out-and-out comic segment to mix things up. It seems that “grim and gritty” is back in style. Probably the thing that appealed to me the most about this movie is getting to see new takes on an animated Batman. I LOVED the Timm designs that got their start on Batman: The Animated Series, but after dozens of Batman and Justice League shows (plus five seasons of Jeff Matsuda’s The Batman), I’m ready for something new. And what I saw here impressed me. 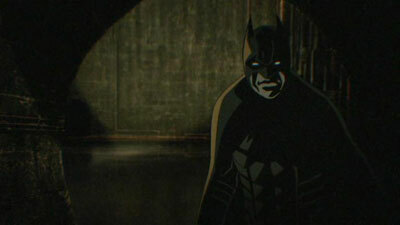 The first segment was particularly promising in offering a unique visual style, though some may cringe at a frumpy-looking Batman. After that, most of the segments looked like a modern comic come to life, complete with the comics’ exaggerated anatomy, which the animators regardless managed to animate fairly well. In the past, attempts at replicating a “realistic” comic book style were often met with failure, as the lack of drawing skill of the animators involved rendered the character designs unwieldy. Think The Avengers. Ugh. Similarly, Super Friends is often difficult to watch, as the animators can be seen to be struggling with characters that aren’t anthropomorphic animals. 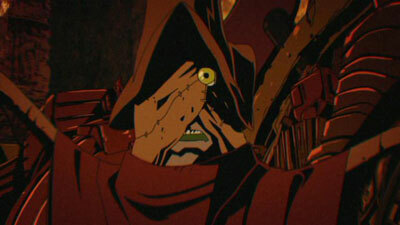 In Gotham Knight, though, the animation is often quite captivating, despite the intricate character designs. Some segments naturally come off better than others, though, with the animation sometimes coming off as jerky, even if the visuals are always outstanding overall. The stories, on the other hand, range from pretty good to pedestrian. I wouldn’t say that there’s a stinker in the bunch, just a lot of stuff we’ve seen before in comics or cartoons. This is plainly true of the first segment, Have I Got A Story For You. 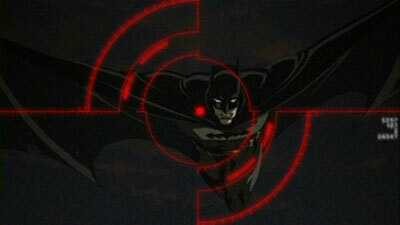 The premise is simply the same as was used in an episode for the final season of Timm & Company’s last Batman season. Just as in the TV episode Legends Of The Dark Knight, a group of young people recall stories of Batman, with each person describing a seemingly different person. There are a few differences here, as the kids in the Gotham Knight story are older skateboarders, and they are recounting their own encounters as opposed to stories they have heard. But otherwise the structure is quite the same. Still, I did enjoy seeing the various interpretations of Batman, from a mystical red-eyed Batman, to a creature with real bat-wings, to a high-tech version who emerges from a command carrier in sophisticated armor. I also liked how the three stories all fit together (though not in chronological order), and how an appearance by Batman at the end places all their tales into perspective and effectively wraps up the story. Crossfire is a tale penned by Batman comic writer (and crime novelist) Greg Rucka, where he is able to revisit the setting of Gotham Central PD. The focus is on the officers in Lieutenant James Gordon’s major crimes unit, principally Crispus Allen and his partner Anna Ramirez (substituting for Renee Montoya, owing to events in The Dark Knight). Ramirez appreciates the help that Batman has given the city, and for the first time in her lifetime she feels a sense of hope in her hometown. Allen, on the other hand, resents the interference by someone he views as a vigilante with a too-close relationship with his boss. He may have to change his attitude when Batman intervenes in a firefight between gangsters known as The Russian and Maroni— a firefight in which Allen and Ramirez are caught in the middle. Field Test continues the loose storyline, with a jarring change of visual style. This segment looks more like what people commonly perceive as an “anime look,” with a hero that has walnut eyes and a pointy nose. Bruce Wayne looks younger than ever here, making less of a good fit between the visuals and Kevin Conroy’s mature voice. Nevertheless, it’s a good tale of how Batman tries a new gadget designed by Lucius Fox as he enters into a conflict between The Russian and Maroni. (Yes, again. It does seem repetitive, especially with these segments appearing back-to-back). In Darkness Dwells picks up a thread from Batman Begins, showing what became of that film’s surviving villain. David Goyer, co-writer of the current Batman film series, appropriately writes this entry. Gordon’s crew is investigating a priest’s abduction by a scaly monster. Gordon is not sure whether to believe the rumors about Killer Croc, while Batman mentions The Scarecrow as a suspect. 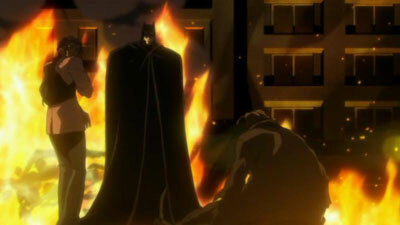 As Batman enters the world below Gotham, he finds both men and engages in a terrifying battle with each of them. This is a good example of superior artwork and animation in support of a thin story. Working Through Pain is the contribution by celebrated comics writer Brian Azarello. Most of the tale is told in flashback, relating Bruce Wayne’s experiences overseas, experiences that taught him how to manage pain. From his volunteer work as a medic, to his training by a mysterious woman who would train him when the fakirs would not, this story offers the best glimpse at what it took for Bruce to become Batman. Finally, Alan Burnett, a co-producer alongside Timm on previous DC animation projects, takes his stab at writing a story about Deadshot. 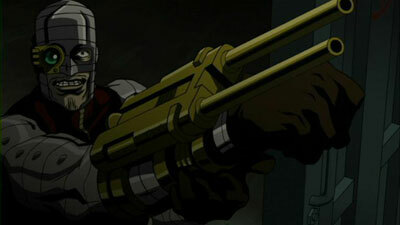 The Russian puts out a contract on Batman, and the natural choice of mercenary killer is Deadshot, a man with uncanny aim. The battle of skill and wits is fun to watch, even if this segment too is more about the graphics than the straightforward story being told. And then the movie ends. This effort was certainly better than the Superman: Doomsday movie that started this line, but it also falls quite short of the greatness of Justice League: The New Frontier. The anthology nature of Gotham Knight obviously hampers it, with the individual segments offering lots of eyes candy but only a dash of brain candy. 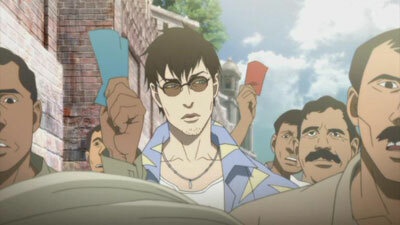 I enjoyed each segment for what it was, even if the total effect falls short of what The Animatrix achieved. No doubt the animators (and various artists) had fun, it is just that the stories are generally of a common type, little different from what we’ve seen from Batman before. The quirk of setting them in the “movie universe” makes this movie unique, while also preventing the writers from entering into more diverse territory. Several appearances by The Russian may have given the movie some consistency, but he is never more than a cartoon-ish gangster. The blood and violence in this PG-13 movie makes it unsuitable for children, but if designed for adults I would have appreciated a little more depth. 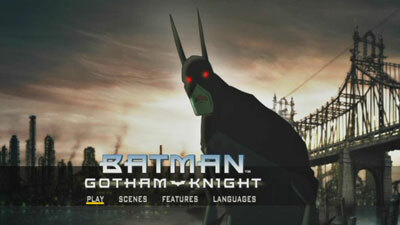 Still, as a visceral experience and a showcase for some great animation, it’s still a must-see for Batman fans. This movie came out in three different releases, with two different configurations of bonus features. 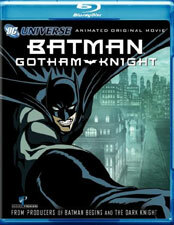 The single-disc DVD comes with an Audio Commentary featuring DC executive Gregory Noveck, former Batman editor/writer Denny O’Neil, and voice actor Kevin Conroy. They offer a surprising amount of enjoyable comments about Batman, mixed in with less-interesting musings about the movie. The best part for me, though, was Conroy’s story of what happened when he was volunteering in a kitchen a week after 9/11. If for no other reason, listen to the commentary for that. 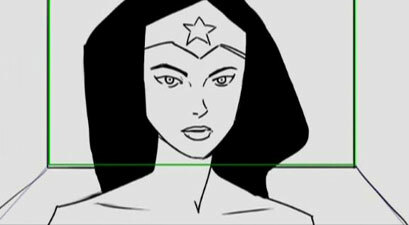 Next, in order to promote the next DC animated movie, a Sneak Peek At Wonder Woman (10:26) featurette has been included. 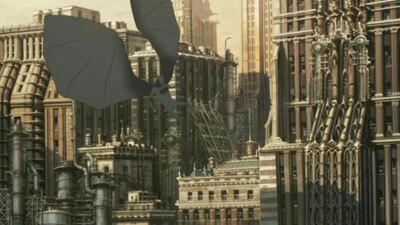 No actual animated footage is shown, but members of the creative team and the cast are interviewed, with plenty of storyboards and character sketches shown. I definitely look forward to this, which appears to be a fairly traditional retelling of the Wonder Woman origin story. The two-disc set and the Blu-ray version both have a couple of more featurettes, and even on the Blu-ray version they are unfortunately in standard definition. Batman And Me, A Devotion To Destiny: The Bob Kane Story (38:25) is a nifty biography of the man who created Batman. Tom Andrae, who wrote a similarly titled biography on Kane a number of years ago, is the main speaker in this documentary. Mark Hamill and Stan Lee also share their admiration and affection while describing Kane. It’s amazing what gems sometimes can turn up on discs. This has nothing to do directly with the main feature, but it’s maybe the best part of the whole package. A Mirror For The Bat (35:47) features a group of DC writers and others discuss Batman’s rogues gallery of eccentric villains. Though there will be little here that is illuminating for the Batman expert, it does have a hefty length that makes for interesting viewing, particularly if you want to see what some of your favorite writers really look like. Additionally, the two-disc set and the Blu-ray also have four episodes from Batman: The Animated Series, which are in varying degrees appropriate to the main feature. Heart Of Ice is simply a great example of the fine storytelling and nuanced writing seen in that show, featuring the tragic love story of Mr. Freeze. I Am The Night examines, just as this new movie, the early life of Batman. Legends Of The Dark Knight, as I mentioned earlier, seems to have been the inspiration behind the similar first segment on Gotham Knight. Over The Edge is a great story of Batman and Batgirl and their relationship to Commissioner Gordon, and it is certainly one of my favorites. Interestingly, the Blu-ray has all of these episodes matted to 16:9! I’m not sure how Bruce Timm feels about it, but it was weird seeing them as anything other than in their native 4:3 ratio. The DVDs also have Trailers for 10,000 B.C., Appleseed: Ex Machina, The Dark Knight, Journey To The Center Of The Earth, Lego Batman, and Popeye The Sailor: Volume 2. The Blu-ray does not include the trailers. The DVD versions come in standard keepcases, and the Blu-ray in its standard case. I have seen some DVD cases (both versions) with lenticular covers, with the two-disc version being die-cut, with the lenticular image being to the right. Unfortunately, the Blu-ray version seems to have been stuck without having any copies with the snazzy dual “3-D” images. The DVD video is good, but comes off as generally soft. 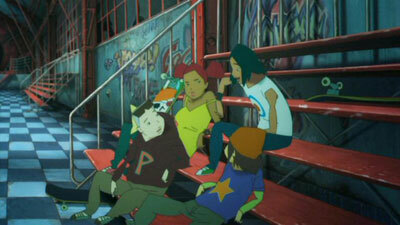 The compression work yields minimal artifacts, but this is not the sharpest animation I’ve seen on DVD. This is largely due to the frequent use of diffuse lighting by a few of the sequence directors. There is some very occasional, minor video noise, even on the hi-def disc, but it’s easy to overlook. The Blu-ray disc is a better experience overall, with a more distinct look. The sharper edges and more clearly defined color gradations bring it a step up over the standard def version, even if the difference is subtle. The DVDs carry numerous language options, including English, Spanish, Portuguese, Japanese, and Thai. The same languages are offered as subtitles. The Blu-ray has audio and subtitles in English (still just plain old Dolby Digital 5.1), Spanish (2.0), German (2.0), and Japanese (5.1 channels). You cannot choose the Japanese track without unlocking it (see this thread in our Forum— thanks, George! ), as it is not an option on the menu, and cannot be switched to using your remote’s audio button. The English track is quite involving, with a strong sound that brings you into the movie with its combination of sound effects, strong voice acting, and music. The sound effects tend to be front-heavy, but they come at you with such force it hardly matters. 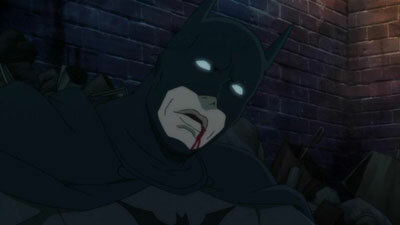 As mentioned, Kevin Conroy returns to the Batman character after his defining interpretation on the Timm shows. While you can never go wrong with this casting choice, it is odd to hear that voice with such different visuals. Other Timm voice favorites appear as well in various roles, including George “Superman” Newbern and Will Friedle (another “Batman”!). Former “Joker” Kevin Michael Richardson is here, too, and veteran actor David McCallum plays Alfred. The commentary confirms that the dialog recording in this case was done after the animation was done, as is usual in anime. This is one of those titles that gets recommended not so much for the story, but the strength of the work of the artists involved, and some pretty nice special features. The individual sequences are generally good but not great in the story department, but I loved the look of every piece. If you can, spring for the two-disc set for the great biography documentary on Bob Kane, as it alone makes this a worthy purchase all on its own if you’re a Batman buff. Better yet, get the Blu-ray version for upgraded video. Overall, the main feature is a worthy addition to the DC Animated line, a line that I hope stays healthy for a long time.